Explanation: Sweeping through northern skies, Comet Catalina (C/2013 US10) made its closest approach on January 17, passing about 6 light-minutes from our fair planet. Dust and ion tails clearly separated in this Earth-based view, the comet is also posed for a Messier moment, near the line-of-sight to M101, grand spiral galaxy in Ursa Major. A cosmic pinwheel at the lower left, M101 is nearly twice the size of our own Milky Way galaxy, but some 270 thousand light-centuries away. 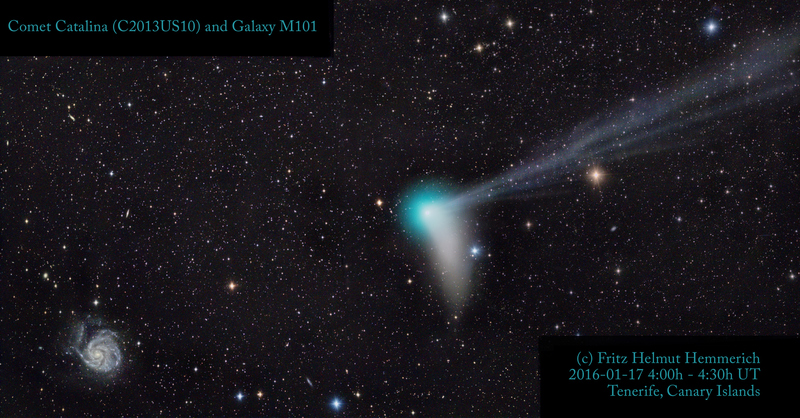 Both galaxy and comet are relatively bright, easy targets for binocular-equipped skygazers. But Comet Catalina is now outbound from the inner Solar System and will slowly fade in coming months. This telescopic two panel mosaic spans about 5 degrees (10 Full Moons) on the sky.